Depending on the level of use your athletics facility gets, the high jump dimensions can vary for each surface that we install. Typically the area will be in a 180 degree semi-circular fan shape to allow athletes the best run up before completing their jump. Specialist equipment and accessories supplied for this event will also come in a range of sizes to meet different performance requirements. We install recreational athletics areas for schools and colleges in the UK, the high jump dimensions for these surfaces can be custom made to fit the outdoor space you have available. It is recommended that the minimum area size for a school practise runway is 15m. 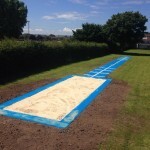 This will give students a good amount of space for a run before they complete their jump. For an athletics facility of this nature which is used just for PE lessons, after school clubs and small competitions, the best surface type to choose would be Multisport synthetic surfacing. This is a knitted artificial carpet which is ideal for recreational sports surfaces, fill in our contact form to find out more on this specification. If your athletics run up is going to be used as a professional facility for international competitions and events, the minimum high jump dimensions should be 20m. However it is preferable to have a 25m runway for this kind of area to allow athletes more space to complete a run up. With this kind of professional facility we would usually install the runway in a polymeric EPDM rubber surface as this is approved to IAAF performance standards. As this is a premium product it comes at a higher price so we wouldn’t recommend it for a school or recreational surface unless it is going to be used for international standard events. As well as completing installation projects for athletics surfacing in the UK, we supply high jump equipment for training and competitions at clubs, schools, colleges and universities. Because each sports facility is different and the people who use them will vary in ability, there are a range of high jump equipment sizes and specifications. An important accessory which is used for safety in high jump is the landing mat, this is made of soft foam with PVC covers. We will supply these specialist safety mats to a range of sizes for different performance standards. The smallest dimensions that we offer for school and club high jump mattresses are 5m x 2.5m which is ideal for a simple practise area. 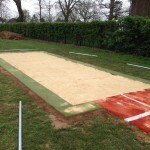 Larger mats can be supplied up to 7m x 4m for international IAAF standard competitions. Other accessories such as crossbars and stands are available in a range of heights so you can choose the best specification and high jump equipment sizes for your own facility. Our expert team will be able to offer advice on the best choice of equipment for your high jump facility so you can keep costs down. If you are interested in installing a new athletics surface at your organisation, please contact us via the enquiry form on the left of this page. We can send over product sheets and create bespoke high jump dimensions to suit the space you have available.